OTTER KIT STEALS FROG FROM OTTER MOM? Mother Otters burrow near to, and within, North American Beaver lodges, to give birth and to raise their young. The den will often have many entrances and exits. The mother raises her young alone. At about five weeks old the newborns will begin playing. At two months, the kits (also called pups) coat has grown in and she introduces them to water. At nine weeks they begin to eat solid food and are weaned by twelve weeks. 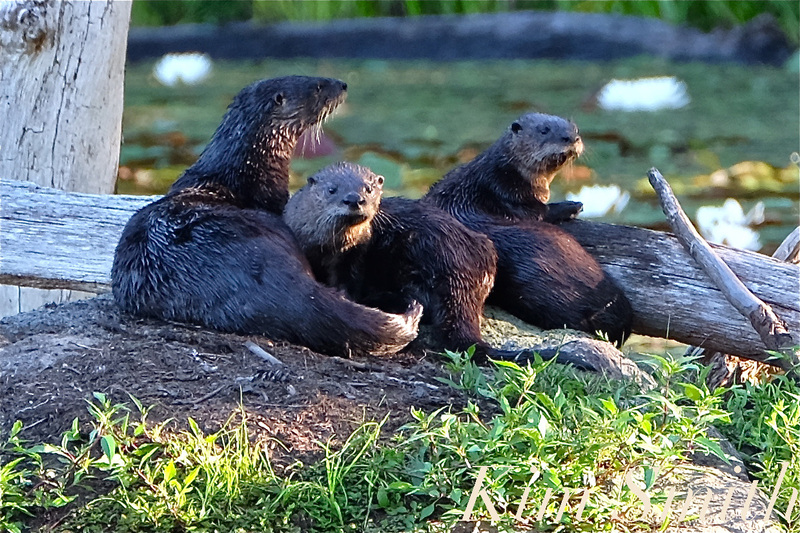 The family bond is beautiful to watch and the young River Otters are utterly adorable in their playfulness. Just some of the familial behaviors that have been so wonderful to observe–otters grooming each other, snuggling under Mom (and playfully biting her tail), siblings wrestling each other, and all taking a morning nap together. One of the most interesting moments was observing what happened one morning after the mother caught a frog. At first look it appeared as though the kit was stealing the frog from her, but after examining the footage, she caught the frog and deliberately incapacitated it, although she did not eat. She was holding the frog for her young otter to come and catch it from her. An Otter’s whiskers are extra sensitive; the long whiskers have evolved to aid in hunting underwater. NA River otters are near-sighted, possibly as a result of underwater hunting. 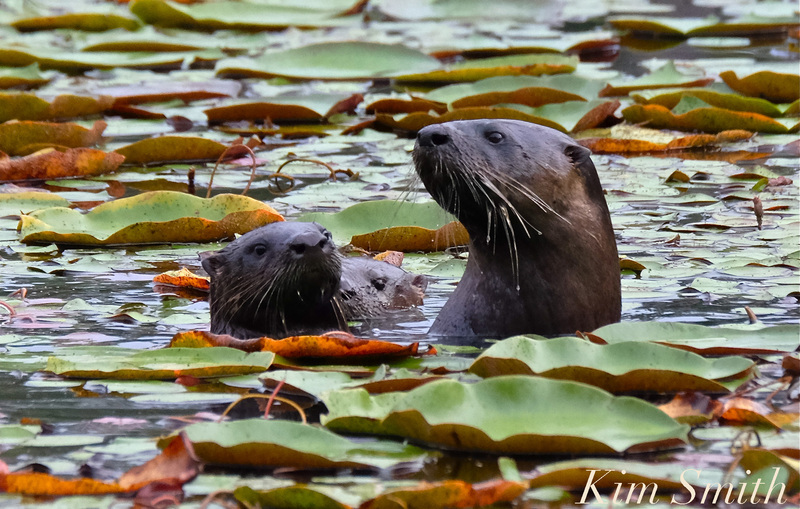 Cape Ann’s growing Otter population is a clear sign that our waterways are in good health. North American River Otters are very sensitive to dirty water. 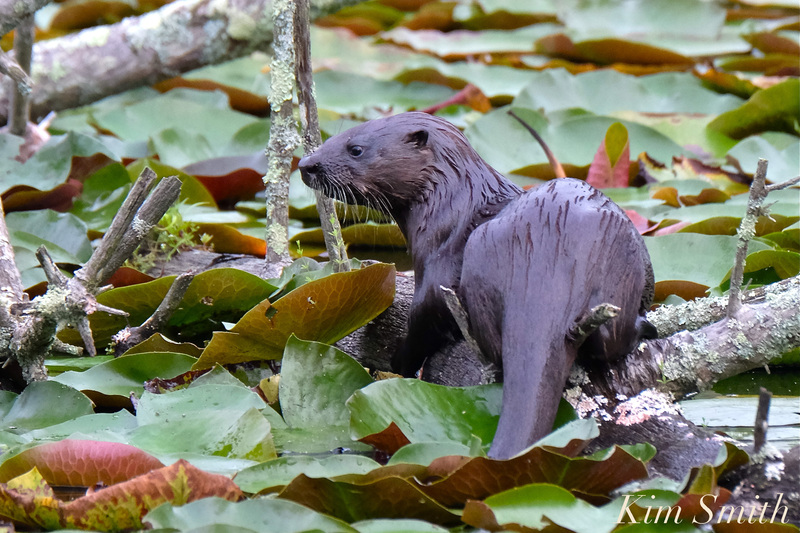 Clean water, along with the expanded range of the North American Beavers, has helped create a welcoming habitat for River Otters to dwell and to breed. Mom continually checks the landscape for pending danger. At the slightest hint of disturbance, underwater they all go. A NA River Otter can last up to four minutes underwater. 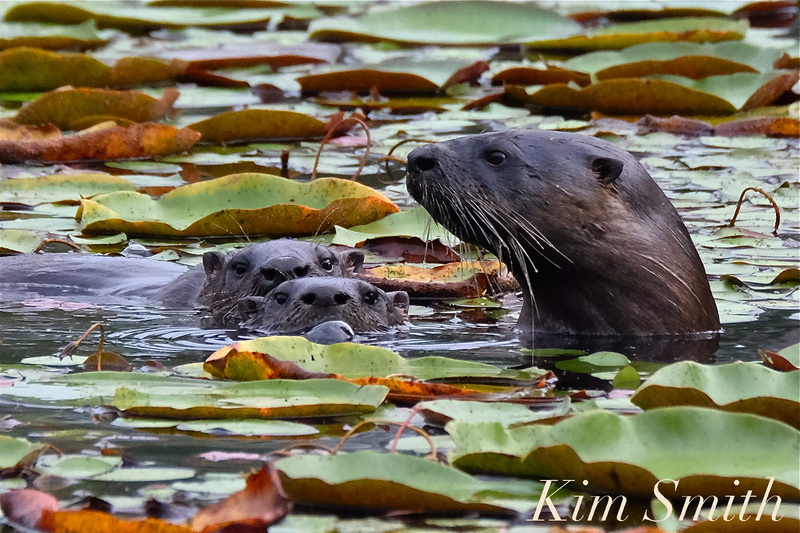 This entry was posted in Cape Ann Wildlife and tagged Cape Ann, Gloucester, Lontra canadensis, New England Pond Ecology, North American Beaver, North American River Otter, Otter kit, Otter pup on September 12, 2018 by Kim Smith.